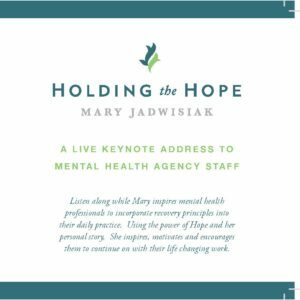 Based on over twenty years of advocacy and experience training others, Mary Jadwisiak brings her message of Hope to everything she does. She offers a wide variety of workshops and training programs which can be customized to meet your specific needs and goals. Contact Mary to learn more about how her training programs and workshops can propel your organization toward a new way of thinking about and treating about mental health recovery. Mary’s work is consistently met with unqualified satisfaction. After attending this training, staff will be able to incorporate the principles of recovery into your everyday practice and have a greater trust in the client’s inherent knowledge of what they need to get well and stay well. 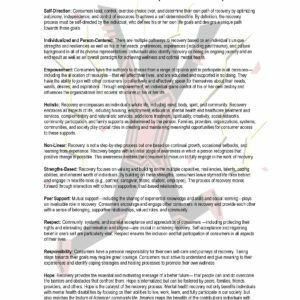 Based on SAMSHA’s 10 Fundamentals of Recovery, this training provides practical tools to incorporate into everyday work. Participants will redefine the concepts of Hope, self Determination, choice and healing. They will come away with a concise understanding of recovery concepts and how to use those concepts to facilitate recovery. This training has modules which can be divided into a series, a “brown bag” discussion format, or presented as full or half-day workshops. Learn how to design a successful peer support program for your agency before you begin the hiring process. This workshop helps supervisors and clinical managers avoid the common mistakes that undermine this fantastic tool for recovery. People with mental illness aren’t the only ones who recover! This workshop will help you see how creating an agency-wide culture of recovery is vital to a healthy workplace. Hope, Respect and Self Determination can create an environment that helps reduces staff burnout and turn over while improving consumer outcomes. By examining the similarities between grief symptoms and those of some mental illnesses, we can explore the interplay between human emotions and clinical symptoms. Both clinicians and consumers are encouraged to examine the role of grief as a tool for learning to experience strong emotions without running for cover (or sedatives). Resiliency is an essential component to recovery. This 90-minute workshop, designed for corporate clients, identifies strategies for developing a capacity to be resilient. Participants leave the workshop with practical steps they can take to develop or increase their capacity to be resilient. The skills leaned are applicable for anyone wanting to increase their power as they navigate life’s challenges. This workshop is designed for receptionist, front office staff, clerical workers, maintenance staff or any other non-clinical employee who come into contact with mental health consumers during the course of their jobs. This workshop is also perfect for social service providers who are not mental health professionals, but work with people with mental illness in the course of their jobs. People with mental illness can and do recover. After attending this training, clinicians will be able to incorporate the principles of recovery into everyday practice and have a greater trust in the client’s inherent knowledge of what they need to get their life back. Consumers will be empowered to claim their role in their personal recovery journey. 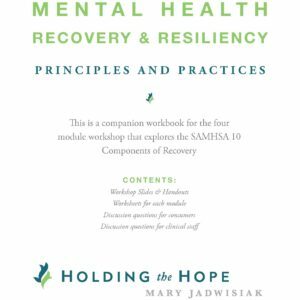 Based on SAMSHA’s 10 Fundamentals of Recovery, this training identifies practical tools to incorporate into everyday work between consumers and clinicians. Participants will explore the concept of choice and healing and come away with a concise understanding of client rights and how they facilitate recovery. Recovery is process of insights that requires skills far beyond symptom management. How do we stay well while managing the grief and loss brought forth by the illness or normal life circumstances? This workshop helps people increasing their ability for sustaining their recovery and moving forward with life. You can recover. Learn how to overcome the barriers to getting on with your life. Accepting responsibility for managing your illness & your recovery helps you recognize that you are more than a diagnosis. This training approaches recovery from a holistic perspective and give participants the tools to see their illness within the context of their whole lives. Topics covered include: Wellness, alternative healing approaches, personal responsibility for symptom management, advocacy skills for getting the help you need, identifying areas of “system dependency”. This workshop explores the role of Spirituality in the healing process. Powerful discussions help participants explore the power spirituality in their recovery journey. Participants leave with an understanding of the value of their personal healing practices. By examining the similarities between grief symptoms and those of some mental illnesses, we can explore the interplay between human emotions and clinical symptoms. Both clinicians and consumers encouraged to examine the role of grief as a tool for learning to experience strong emotions without running for cover (or sedatives). People with mental illness can and do recover! Participants leave this workshop with a better understanding of mental illness and its impact on their community and citizens. After learning the components of recovery as outlined in the SAMHSA national consensus statement on recovery, they know how to better assist in the recovery efforts of individuals with mental illness in their lives. Resiliency helps increase an employee’s ability to manage stress and avoid burnout. This workshop, designed for corporate clients’ wellness initiative, identifies strategies for developing the capacity to be resilient. Participants leave the workshop with practical steps they can take to develop or increase their capacity to be resilient. The skills leaned are applicable for anyone wanting to increase their power as they navigate life’s challenges. Designed for WorkSource staff or other service provider agencies that serve people who may experience mental illness, this workshop helps staff not trained as mental health professionals successfully help the people they serve. Participants gain an understanding of the barriers facing their clients and are better prepared to support their efforts.